Love and hate, desires and memories – if there's one thing they have in common, it is how they wrap themselves around you like a snake, never to let you go. A timid single child, Nadeko did not demand much from the world around her. She had few friends, but carved all compassion received deep into her heart, never to forget it. And her life could have gone on like this, with Nadeko unseen by others and never complaining about it. But what awaits her as punishment for honest feelings is a spiral of fear and pain as her life is slowly wrenched from her hands by the hatred of another. The girl who never once complained about her fate sets out to conquer this danger on her own, no matter how dirty her hands will have to become on the way. Her lips are shut tight and her downcast eyes reveal nothing of the anguish she's going through. Only sometimes, in the depths of her soul, she wishes someone would come and save her from this hell. 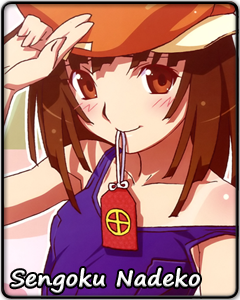 Remarkable in her dedication and fortitude, Nadeko is a girl who, by a cruel whim of fate, faces powers far beyond her. Her spirit and will are unbroken, but that's not the case for her fragile body. Will there be someone to lend her a hand in this uneven fight?